Kitchens are one of the most beautiful and unique locations in a home for custom stained glass windows. This is the room where your whole family spends a lot of time, and it seems like the room everyone ends up in during a party. So adding something that shows your personal style and really brings a room to life, like stained glass windows, it an investment worth considering. Cabinet Doors: Taking the doors off cabinets doors in your kitchen or having glass front doors is a great way to give your kitchen a more open feel. The problem is often the cabinets are too exposed or look all together bare and lifeless. 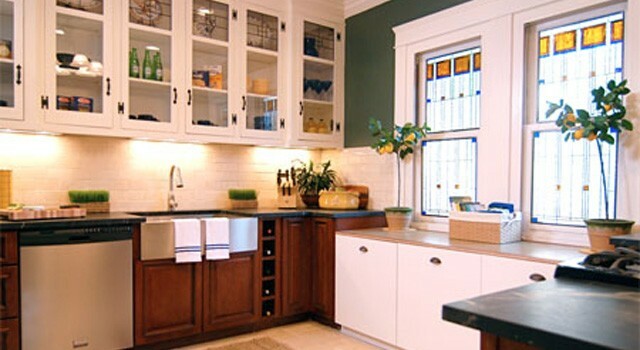 By adding stained or leaded glass to your kitchen cabinet doors, you get that open feel with a designers touch. Windows: Stained Glass windows not only increase privacy in your home but is also the perfect personal touch. While allowing in much-desired natural light these windows also show off your individual style. Decorating a room like a kitchen can be challenging. The solution: decorate your kitchen around a bold element like stained glass and decorating becomes a breeze. No matter what type of stained glass you are looking for in your kitchen, choosing the right contractor is a must. Properly manufactured and installed stained glass can last decades upon decades and increase your home’s value. Denver Stained Glass has been serving the Denver/Metro area for over 25 years and we are Colorado’s industry leader. Our local craftsmen are the best in Colorado and it shows in their immaculate work. To find out the difference experience makes and to schedule a free in-home consultation contact us today!